Preheat oven to 350 degrees. Spray a 13 x 9 baking dish with non-stick cooking spray. Set aside. Heat oil in a large skillet over medium high heat. Add onion and pepper and cook for 8 minutes. Add ground beef or beef substitute and cook until browned, about 5 minutes. Drain if necessary. Add tomato sauce, tomatoes, vinegar, Italian seasoning, garlic powder, crushed red pepper and salt. Reduce heat to medium low and cook for 15 minutes. Place mozzarella and quinoa in a large bowl and toss with sauce. Transfer to prepared dish and top with provolone. Bake for 25 minutes, until bubbly. 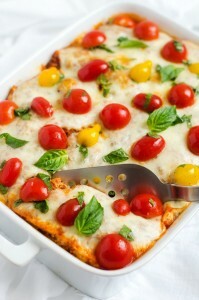 Let stand for 10 minutes and then top with Fresh Tomato Topping. Meanwhile, To make the Fresh Tomato Topping, combine tomatoes, basil, vinegar, olive oil, garlic, sea salt and ground black pepper and allow to sit at room temperature for 30 minutes.